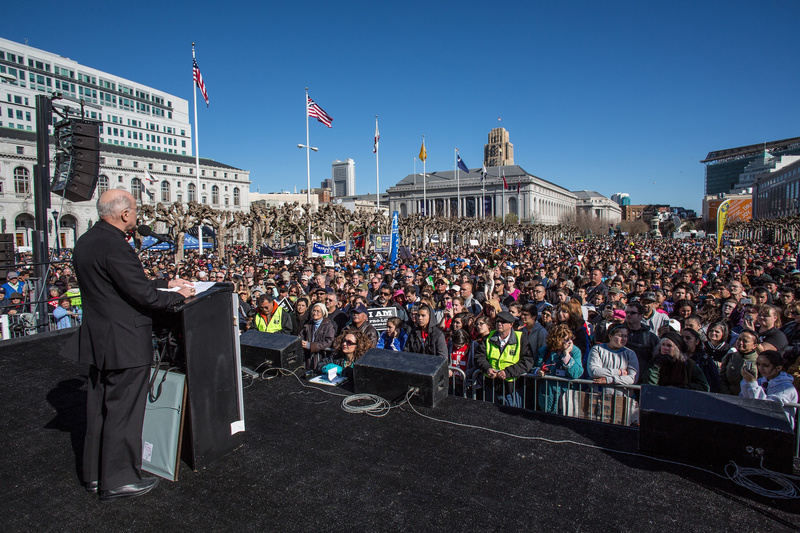 SAN FRANCISCO (CNS) — Tens of thousands of pro-life supporters crammed San Francisco’s Civic Center Plaza and walked through the city’s center for the ninth annual Walk for Life West Coast Jan. 26. “The pro-life movement is here to stay, we’re here to grow,” the walk’s co-chair, Eva Muntean, told the rally. Following the rally, participants walked the two miles from City Hall to the Ferry Building, traveling through the heart of the city’s shopping and financial districts, filling Market Street for more than one mile. More than 50,000 participated, organizers estimated. Speakers included Lacey Buchanan, the mother of a disabled child; Elaine Riddick, who was forcibly sterilized by the state of North Carolina at age 14; Kelly and Matthew Clinger, who regret the two abortions Kelly had; and the Rev. Clenard Childress Jr., who has spoken at nearly every West Coast walk since the event began in 2005. A Walk for Life Mass at St. Mary’s Cathedral celebrated by Archbishop Cordileone drew a standing-room-only crowd that morning. “The Gospel of life will only be proclaimed through lives of holiness,” the archbishop said in his homily. Many groups attended Mass in their home parish before traveling to Civic Center for the 12:30 p.m. rally. A group from St. Anne of the Sunset Parish carried a large new banner on their light rail trip from a San Francisco neighborhood. Parishioners from Our Lady of Angels Parish in Burlingame stood with their banner. “It’s our personal stand for life. There’s this culture of death now, not only in this country but in the world. The only way to fight this is to pray hard and show we support life,” Our Lady of Angels parishioner Errol Zshornack told Catholic San Francisco, the archdiocesan newspaper. A group of about 20 teens from Phoenix sported yellow T-shirts that said, “yeah baby.” David Phillips, 14, of Modesto, Calif., wore a black sweatshirt emblazoned with the slogan “Abortion is mean.” The youth came with a group from St. Joseph Parish “to support the cause of getting rid of abortion,” he said. “We are Catholics and believe Jesus is the life and he comes to give life,” said Yorleny Vargas, who attended with her 12-year-old daughter, Mary Alexis, from St. Paul Parish in San Pablo, Calif. “He can do everything but we need to work, too,” Vargas said. Evie Fong, who teaches religious education at Star of the Sea Parish in San Francisco, attended with two confirmation students. “I’m here with my students, fighting for life, standing up against abortion,” Fong said. Approximately 20 counterdemonstrators waved signs and shouted as pro-life supporters walked the length of Market Street. 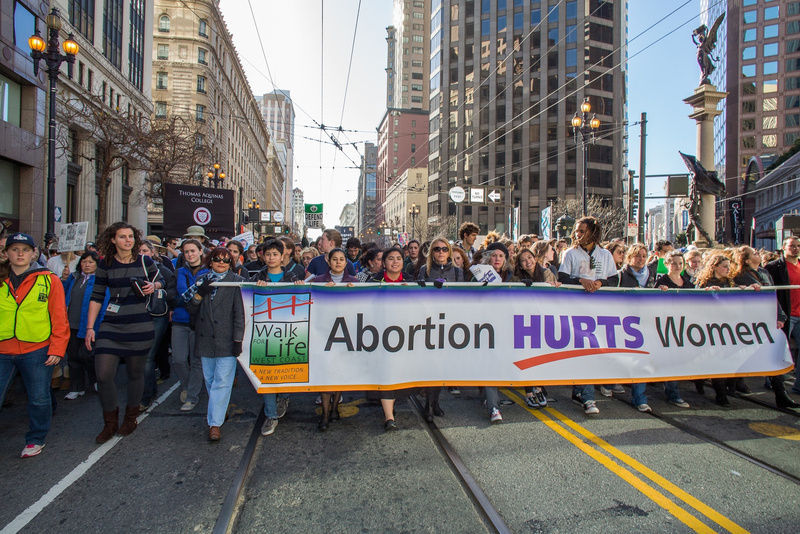 A Jumbotron displaying a graphic video of aborted children was set up by an anti-abortion group midway along the walk route, despite efforts by Walk for Life organizers to dissuade the group from playing the video. A festival and flash dance event supporting keeping abortion legal earlier in the day drew some supporters but dissipated before the pro-life Walk for Life participants reached Justin Herman Plaza.